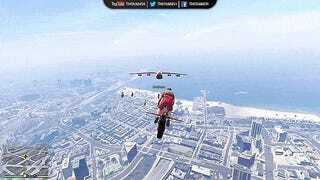 Last month, GTA Online received a massive update that added a motorcycle with a jet engine strapped to the back. 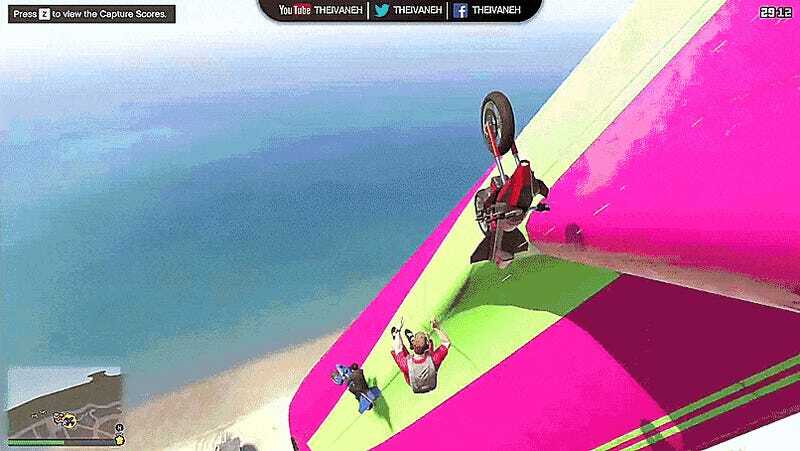 Since then, YouTubers have staged all manner of stunts with the new flying motorbike. TheIvaneh and his group of stunters had a slew of jet bike shenanigans involving a large airplane, as you can see above. Landing on it is one thing, but they also fly right into the open front of the plane at high speeds. Most of them survive the stunt. There’s some wild stuff out there that almost makes me want to buy the bike—but it costs $2.6 million bucks. For many, this toy will be but a coveted fantasy. At least we can live vicariously through the stunt videos.